Is the internet making us stupid? Birkets and Carr get to pondering. Reading Agni editor and Harvard mentor (The Gutenberg Elegies: The Fate of Reading in an Electronic Age) Sven Birkets at his best is like listening to an old-style baritone crooner like Johnny Hartmann squeeze every last nuance from a classic ballad. 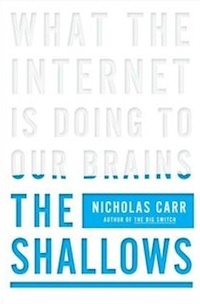 Now concomitant with Birkerts we note the publication of The Shallows: What the Internet Is Doing to Our Brains (WW Norton), in which Nicholas Carr expands his investigation of this still juicy and I fear irresolvable subjectas it is an ontological issue (as least that’s how I view it), resolution is not easily (if at all) achievable. My real worry has less to do with the overthrow of human intelligence by Google-powered artificial intelligence and more with the rapid erosion of certain ways of thinkingtheir demotion, as it were. I mean reflection, a contextual understanding of information, imaginative projection. I mean, in my shorthand, intransitive thinking. Contemplation. Thinking for its own sake, non-instrumental, as opposed to transitive thinking, the kind that would depend on a machine-drive harvesting of facts toward some specified end. Ideally, of course, we have both, left brain and right brain in balance. But the evidence keeps coming in that not only are we hypertrophied on the left-brain side, but we are subscribing wholesale to technologies reinforcing that kind of thinking in every aspect of our lives. The digital paradigm. The Google article in The Atlantic was subtitled What the Internet Is Doing to Our Brains, ominous in its suggestion that brain function is being altered; that what we do is changing how we are by reconditioning our neural functioning. When carried into the realm of the intellect, the industrial ideal of efficiency poses, as Hawthorne understood, a potentially mortal threat to the pastoral ideal of contemplative thought. That doesn’t mean that promoting the rapid discovery and retrieval of information is bad. It’s not. The development of a well-rounded mind requires both an ability to find and quickly parse a wide range of information and a capacity for open-ended reflection. There needs to be time for efficient data collection and time for inefficient contemplation, time to operate the machine and time to sit idly in the garden. We need to work in Google’s world of numbers, but we also need to be able to retreat to Sleepy Hollow. The problem today is that we’re losing our ability to strike a balance between those two very different states of mind. Mentally, we’re in perpetual locomotion. I leave it to you to review Carr’s warning bulletin from the Atlantic. Or even have a go at his cautionary new opus, which may in its way be a test case of the concerns it voices.